Wallies Tropical Window Wallpaper Mural is a new unique way of decorating. The mural is made of pre-pasted, vinyl coated, strippable wallpaper and is easily applied to most smooth surfaces. Loosely roll the piece pattern side out. Submerge in water for 60 seconds, remove the piece from the water, drain off excess water and apply. 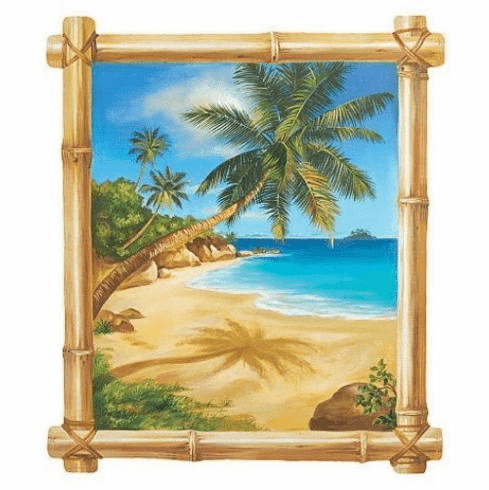 Wallies Tropical Window Wallpaper Mural is brightly colored and includes 1 window panel 26 inches by 30 inches. The package measures 22-1/4 inches by 2 inches.